As you know after reading last week’s entry, which covered issues 39–42, neither Young Donist nor Current Donist was very impressed by those issues. After shifting to a direct market model on my beloved comic series, the comic seemed more intent on having oddball stories, guest appearances that did not work, art that seemed different from not just page to page but panel to panel, and very little attention to the compelling main storyline that enveloped this kid’s world for most of the series. 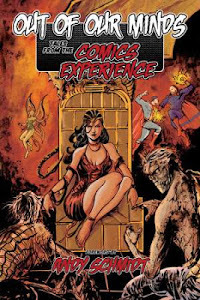 I am fine with a comic veering off course for a few issues, so long as there's something interesting to say, or if it traipses into the realm of Warren Magazine style territory, but those issues had little of that. In the end, it seemed The Micronauts had moved in the direction of smack-you-in-the-face exposition, Marvel Universe guest-star nonsense, cute little tykes as heroes in an effort to open the demographic appeal to a younger audience. This is confusing, especially when the move to the direct market was touted as a boon for true Micronauts fans for a series that deftly handled weird sci-fi action, fascinating characters, despotic rulers, tyranny, organ trade, gambling with one's own body parts, regicide, attempted fratricide, death of loved ones, spies, traitors, and the list goes on. 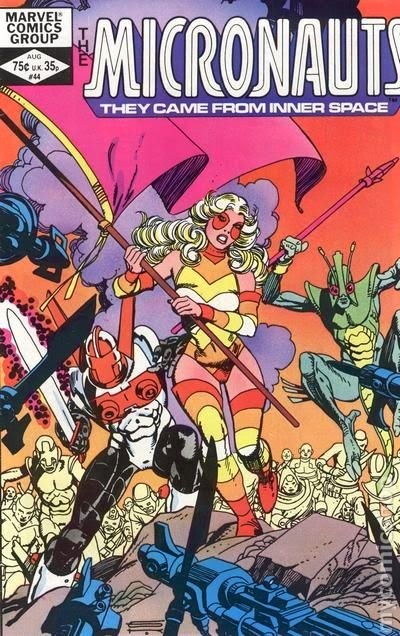 It might just be me, but The Micronauts is not the type of title that easily converts to a broad-based, “kid-friendly” title over the course of an issue or two within the same series. This kid was fine having a brother pronounce his sister and her colleagues traitors to be killed (King Argon's decree for Princess Mari and his hiring of the Death Squad), or the new ruler (again, King Argon) swapping the mind of his former lover and wife-to-be with that of an ambitious elderly duchess who would be more compliant, and the list of craziness continues. If I had not missed issues 38–49, before picking up again with the phenomenal issue 50 (we're getting there!) I might have dropped this book all together. Thank goodness I did not, as things get exciting. The Micronauts #43 - Written by Bill Mantlo, breakdowns by Gil Kane, finishes by Danny Bulanadi, lettered by Jim Novak, colored by Bob Sharen, edited by Al Milgrom, published by Marvel Comics. We open with Bug, Mari, and Acroyear shrinking back to their proper size back in the Microverse after their tussle with the villain Dr. Nemesis. They are home, but they will not receive a warm reception as King Argon, Mari's brother, continues to show the people of Homeworld that he is every bit—if not more—worse than Baron Karza. Meanwhile, Commander Rann, Devil, Microtron, and Nanotron are still on Earth, and after they determine that not even the Avengers can help return them home, they are off to Florida to investigate the Prometheus Pit as their final option. Unfortunately, once there, they will learn that access to the Prometheus Pit is guarded by not one old foe, but two. Young Donist - Heck yeah! The Micronauts I know and love are back. Half of my heroes take up the rebellion against that jack-face King Argon, as the other half hang out with the Avengers—I don't even care about all of the talking. 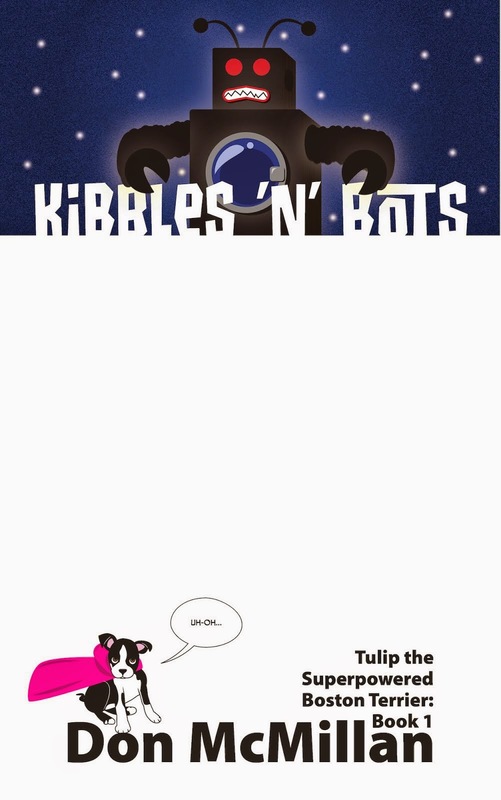 Then two really coold bad guys from the past show up in the same book?! YES! Even though the bad guys only get a couple pages toward the tail end of the book, I was amped for what was about to go down, and the creepy-as-all-heck final panel left me with the best case of Comic Book Anticipation Madness (CoBAM for short. Those seeking further information about this life-affecting disorder should contact either Current Donist or their Local Comic Store). HIGHLY RECOMMENDED! Current Donist - I warned y'all, denizens, that I might spoil things, and that's what's gonna happen. No big spoiler, as the dang cover gives away the big reveal at the end with the zombified Professor Prometheus, but the one pulling the nearly-mindless monstrosity's strings is none other than Computrex, the Living Computer. I love seeing half of our heroes back in the Microverse and taking on the diabolical Force Commander, whose name fits him more than ever as he has shed his humanity to become a being of living energy. But even with all of that happening, I am for the first time in a while excited about what is going down on Earth. 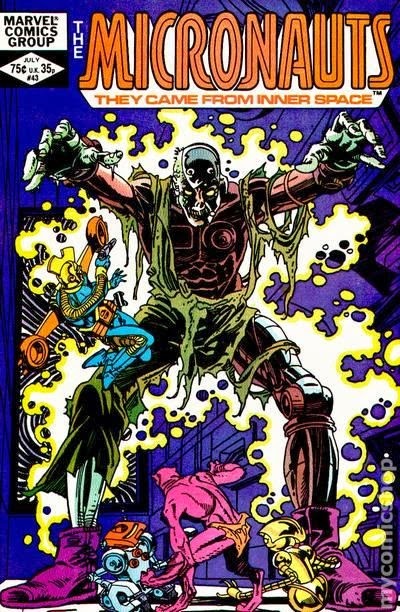 Mantlo brings back two villains, each of whom are cool in their own right, and adds an honestly horrifying twist with the zombified Professor Prometheus. What's even better is that the tone of the book has shifted back to what interested me throughout most of the series, and the blatant exposition of the past few issues has been minimized. Kane's/Bulanadi's art is fantastic, although the art style does change noticeably from panel to panel, but I don't care. Just seeing the shambling horror of what is left of Professor Prometheus is enough to leave me whipping through to the next issue. HIGHLY RECOMMENDED! The Micronauts #44 - Written by Bill Mantlo, breakdowns by Gil Kane, finishes by Danny Bulanadi and Al Milgrom and Potts, lettered by Jim Novak, colored by Bob Sharen, edited by Al Milgrom, published by Marvel Comics. The Micronauts's trouble spans two worlds: the Microverse, and Earth. Commander Rann and Devil face a reanimated Professor Prometheus, who is being controlled by the Living Computer, Computrex, as Microtron and Nanotron spin helplessly on a magnetized metal wheel. What's worse is Devil has been loosing more and more control of himself over to his savage, more animalistic side; the scent of Prometheus's rotting flesh is not helping matters. 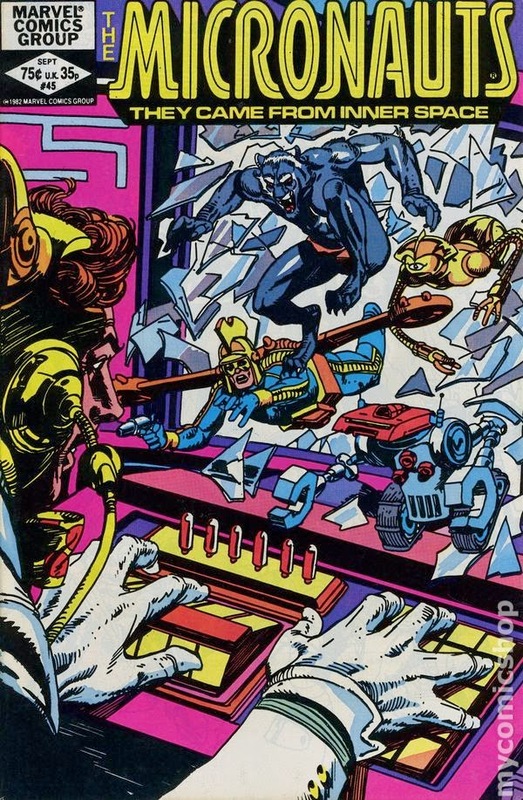 Computrex wants to destroy the Micronauts after “his” past defeat, but the mad computer knows the Microverse has the means to give “him” what he most wants—a living body. Computrex aims to pull the information out of Rann's brain; it will hurt. Meanwhile, Bug, Mari, and Acroyear make a pilgrimage, disguised as pilgrims, into the subterranean area known as Subzone. There they find a new religion has grown that deifies Argon, while hooking the poor inhabitants into a gambling system that robs them of life and limb. Can the separated diminutive heroes survive a rebellion and the horrors of Computrex and the rotting husk of Professor Prometheus?! 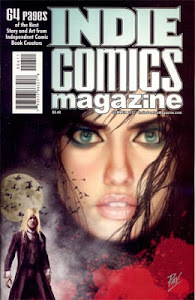 Young Donist - I seem to remember madly running in circles around the living room after reading this issue. It creeped me out in the best of ways and set me on my life-long love of good zombie tales, and my fascination with computers gone awry. Seeing Computrex's needles closing in on Rann's head gave me something to have nightmares about...forever. I will say that the panel of the priest saying, “All you have to do is play…the game,” freaked me out almost as much as those needles. Devil gets a raw deal, that made me furious with Computrex, but seeing him pull himself together and take out Zombo-Prometheus made me cheer. I did, however, find the shifting art styles distracting, but that was not enough to dissuade my opinion of this issue that is HIGHLY RECOMMENDED! Current Donist - Man, that was a heck of a fun issue, even though—or because— it gets fairly brutal in parts. Even though the jarring shifts in the look of the art from panel to panel is noticeable, Kane's underlying storytelling with his breakdowns is unquestionable. With this issue, we clearly see more of Kane's distinct style scattered throughout this highly enjoyable issue. The actual story is even more fantastic, as Mantlo juggles two worlds and a dozen heroes and villains with ease. The final scenes of Computrex having to turn on Zombo-Prometheus is just too cool and keeps me on my toes to this day. The finale of Rann, Devil, Microtron and Nanotron being converted into waves of light left me eager for the next issue. HIGHLY RECOMMENDED! The Micronauts #45 - Written by Bill Mantlo, breakdowns by Gil Kane, finishes by Danny Bulanadi, lettered by Jim Novak, colored by Bob Sharen, edited by Al Milgrom, published by Marvel Comics. The vile villain Arcade has his sights set on tormenting the X-Men, but when he shoots a energy beam to transport his foes into his Murder Machine, he inadvertently intercepts the lightwave containing Rann, Devil, Microtron, and Nanotron. Despite his initial disappointment, he can still have fun with these heroic-looking newcomers. Back on Homeworld, Bug, Acroyear, and Mari lead the rebellion against the tyranical Argon. Princess Mari eventually confronts her brother, who is no longer human, and finds herself in a mismatched fight to the death that does not go her way. Young Donist - I had no idea who Arcade was, but the fact that he was pitting half of the Micronauts against the equivalent of “Dig Dug” and “Galaga” got my attention. I especially loved the look of the knockouts of pink and blue in the video game, but what got me the most was the fight between Mari and Argon, as Bug and Acroyear set out to rescue Prince Pharoid (yay!). Despite being completely out matched by her living-energy brother, Mari fights on and...I wish I could marry her when I grow up. Lady Slug (in Belladonna's aged body) showing up to try to take out the mad ruler only made this portion of the story set in the Microverse even more awesomerer. Then—HOLY CRAP! IS MARI DEAD?! I know she’s not, but dang…brutal. HIGHLY RECOMMENDED! Current Donist - Okay, I guess Marvel wasn't done with the Marvel U guest star action with this one-issue fight with Arcade, but it still works well and is a heck of a lot of fun…once I pushed past one huge problem. What might that be? Well, glad you asked. Arcade essentially pits our heroes against his evil Atari 2600. Now, here is the problem with reading about tech of the time—two decades later it is massively outdated. You see, denizens, at one time in my life, I beat the NES video game “Metroid,” so beating the equivalent of Atari's “Adventure” is something even Current Donist could do, so, yeah, no big whup. Pushing that aside, this is a heck of a fun read. But still, my interest lies with the Mari and Argon fight and that freakin’ gorgeous splash page that I wish I owned. Holy cow! I don’t remember how Mari pulls through, but dang if I don't want to jump right on into the next issue. If I wasn't already happily married, I think Mari and I would make a great couple…long walks on the beach, quiet dinners out, watching the love of my life beat the hell out of anyone who messed with us...hmmmmmm... HIGHLY RECOMMENDED! Well there you have it. The Micronauts has redeemed itself both with Young Donist and Current Donist. My memory of what is coming over the next three issues is quite fuzzy, but I do remember that things are about to get very very very weird, but in the best of ways. Some gnarly stuff is on the horizon, and I hope you join me to hear all about it. Thanks for stopping by, and may the Enigma Force be with you. While writing this entry, I listened to Grant Green's albums “First Session” and the damn phenomenal “Idle Moments” each of which are perfect for writing or getting into the groove of whatever it is you are doing. These songs are pure aural bliss. Oh yeah...Go see Captain America 2!!!! !